If you were able to remember where you put your keys on your way out the door this morning, it’s because – somehow – synapses in your brain changed their properties to encode this information and store it until you needed it. This process, known as “synaptic plasticity”, is essential for the continuity of our memory and sense of self, and yet we are only beginning to grasp the molecular mechanisms that enable this amazing feat of constant information storage and retrieval. Now a collaborative paper from the Turrigiano and Nelson labs just published in Cell Reports sheds important new light into how experience interacts with the genome to allow synapses to change their strength to store information. Synapses are the connections between neurons, and it has long been appreciated that information is stored in large part through changes in the strength of these connections. Changes in strength at many synapses are in turn determined by the number of neurotransmitter receptors that are clustered at synaptic sites – the more receptors synapses have, the easier it is for neurons to excite each other to transmit information. Synapses are highly complicated molecular machines that utilize at least 300 different proteins that interact to traffic these receptors to synapses and sequester them there, and exactly how a change in experience alters the function of this nano-machine to enhance the number of synaptic receptors is still a matter of puzzlement. In this study the Brandeis team devised a way to screen for candidate proteins that are critical for a particular form of synaptic plasticity: “synaptic scaling”, thought to be especially important for maintaining brain stability during learning and development. 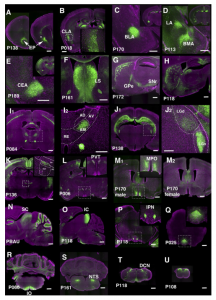 They were able to induce synaptic scaling within specific labelled neurons in the intact mouse brain (layer 4 star pyramidal neurons), and then sort out those labelled neurons from the rest of the brain and probe for changes in gene expression that were correlated with (and potentially causally involved in) the induction of plasticity. This approach produced a small number of candidate genes that were up- or down-regulated during plasticity, to produce more or less of a given protein. The team then went on to show that – when upregulated – one of these candidates (known as µ3A) acts to prevent neurotransmitter receptors from going into the cellular garbage bin (the lysosomes, where proteins are degraded) and instead recycles them to the synapse. Thus increased µ3A flips a switch within cells to enhance receptor recycling, and this in turn increases synaptic strength. 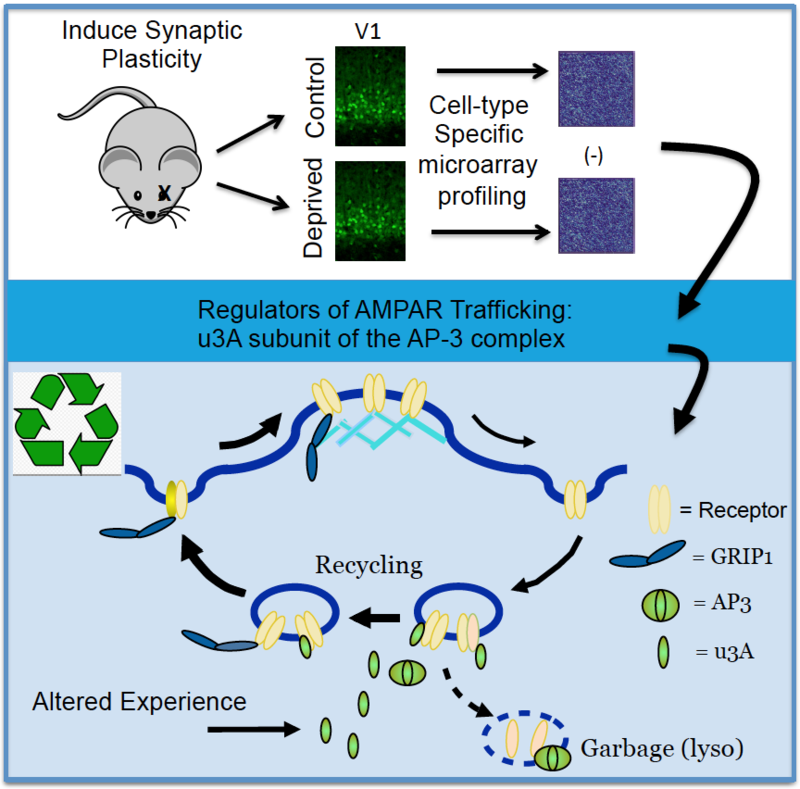 A screen for genes with altered expression during synaptic plasiticity in specific neurons revealed that µ3A plays a critical role in the recycling of AMPA-type neurotransmitter receptors at the synapse. When this protein is upregulated, it prevents receptors from being trafficked into lysosomes, and instead allows them to be recycled back to synapses, increasing synapse number and enhancing synaptic strength. It turns out that many other forms of synaptic plasticity use the same receptor recycling machinery as synaptic scaling, so it is likely that this mechanism represents an important and general way for neurons to alter synaptic strength. This study also raises the possibility that defects in this pathway might contribute to the genesis of neurological disorders in which the stability of brain circuits is disrupted, such as epilepsy and autism. So next time you complain about having to sort your garbage, consider that your neurons do it all the time – and what’s good for the planet turns out to be good for your brain as well. Steinmetz CC, Tatavarty V, Sugino K, Shima Y, Joseph A, Lin H, Rutlin M, Lambo M, Hempel CM, Okaty BW, Paradis S, Nelson SB, Turrigiano G. Upregulation of μ3A Drives Homeostatic Plasticity by Rerouting AMPAR into the Recycling Endosomal Pathway. Cell reports. 2016. Entrepreneurship is alive and well at Brandeis. Last week, fourteen teams of Brandeis scientists presented their research to a panel of industry experts to compete for funding from the Brandeis University Virtual Incubator Sprout Grant Program. The Virtual Incubator seeks to nurture and support entrepreneurial scientists at Brandeis by providing education, mentoring, networking and seed grants to help move their discoveries from the laboratory to the market. Judges were impressed by the team presentations. The teams ranged from biologists who have projects that could be ready for licensing as early as next year, to computer science / IT entrepreneurship students with a web application that already has 1200 users. Let’s say you’re a fisherman/woman trawling for tuna out on the azure-blue waters of the Pacific. Tuna’s your desired catch, but as you drag your net through the water you notice that all manner of aquatic life gets ensnared, to say nothing of styrofoam flotsam, plastic bottles, used automotive parts, and syringes. The FDA has guidelines about these sorts of things and the folks back at Trader Joe’s won’t tolerate even trace amounts of dolphin in their tuna. Bottom line is – you need your tuna to be pure. However, fishing individual tuna out of the sea one by one is extremely labor intensive, and though it may achieve high purity, you’ll be hard pressed to meet your production quotas. The point of all this? Scientists in the Nelson Lab at Brandeis fish for neurons. And not just any neurons, mind you, but very specific types. The end goal is to harvest their mRNA in order to “read out” their global gene expression using microarrays or sequencing based methods. They’re not alone in these pursuits; on the contrary, cell-type-specific gene expression profiling is a burgeoning field. However, like the analogy of fish in the sea, neurons exist in a complex and crowded environment, and isolating specific cell types requires some ingenuity. Different labs have used very different methods. In a recent study published in PLoS ONE, Okaty et al. compiled and re-analyzed all of the publicly available mouse brain, cell-type-specific microarray data (including their own) in order to ask the question: can they detect evidence of contamination, “stress effects” (more on that below), or any other kind of peculiar artifacts stemming from the purification (“fishing”) methods themselves? The short answer: Yes they can. 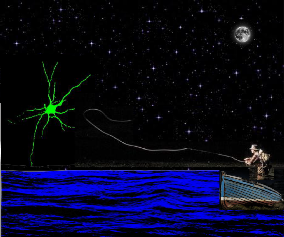 Some methods are fairly low throughput – fishing out one cell at a time. The Manual cell sorting method (a home grown method) dissociates brain tissue, keeps the cells alive in artificial cerebrospinal fluid (almost literally seawater), and then the cell fisherman/woman hand picks labeled cells from the cell suspension with a glass pipette under a microscope (how they’re labeled isn’t terribly relevant to this discussion). This would be like collecting seawater, transferring the fish to less dense holding tanks with artificial seawater and then sorting the yellowfin tuna from the chub mackerel, etcetera. Another of the lower throughput methods is called Laser Capture Microdissection (LCM), where the extracted mouse brain is preserved through formalin fixation or flash freezing. Then thin tissue sections are made with a microtome, and individual cells are carved out of these tissue sections with a laser beam. This would be roughly approximate to freezing a volume of seawater, and then carving out the frozen fish of choice with a laser beam (sounds complicated). The primary difference between these two methods is that Manual sorts dissociated cells, whereas LCM extracts cells from intact, but preserved tissue. Methods like fluorescence activated cell sorting (FACS) and immunopanning (PAN) also sort dissociated cells, and with the aid of flow cytometry, automated fluorometry, and/or the power of antibody selection (cell-type-specific bait), these methods greatly exceed the yields afforded by Manual cell sorting (imagine a dense network of narrow canals in which each fish is entrained in a high velocity stream, and an automated detection system diverts tuna into one channel, chub mackerel into another, and dolphin into another). Finally, a method called translating ribosome affinity purification (TRAP) bypasses the need to sort cells and “pulls down” tagged ribosomes, mRNAs in tow, from non-preserved tissue homogenate (a process which defies fishing analogy). As you might expect, Manual cell sorting, along with FACS and PAN, achieve the highest purity (lowest amount of contamination), whereas LCM and TRAP show strong evidence of contamination from off-target cell types. Another concern is that the stress of dissociating cells or maintaining them in artificial media may perturb gene expression (think nervous, angry, wild fish in a cramped fish tank). However, only in the case of PAN data is there evidence of these effects (elevated levels of stress-response, cell death, and immediate early genes). Finally, the TRAP method extracts only mRNAs that are actively being translated, thus differences between TRAP data and data obtained by other methods may also reveal patterns of posttranscriptional regulation. For the full story, please refer to the paper. No, this isn’t a Russian short story. Lead authors postdoc alum Sebastian Kadener and Mol Cell Biol graduate student Joe Rodriguez and their coworkers used tiling arrays to look for targets of the enzyme Drosha in “Genome-wide identification of targets of the drosha–pasha/DGCR8 complex”, a paper recently published in the journal RNA. Drosha is a type III RNAse that is involved in the processing of miRNAs. This paper demonstrates for first time that this enzyme is not only involved in miRNA processing, but can also process mRNAs. Interestingly, the best example of an mRNA processed by Drosha is the mRNA that encodes another miRNA processing enzyme, the protein Pasha. As this is a partner of Drosha (the two proteins work together), the findings suggest that there is a feedback loop that controls the abundance of the miRNA processing machinery and probably the abundance of miRNAs themselves.